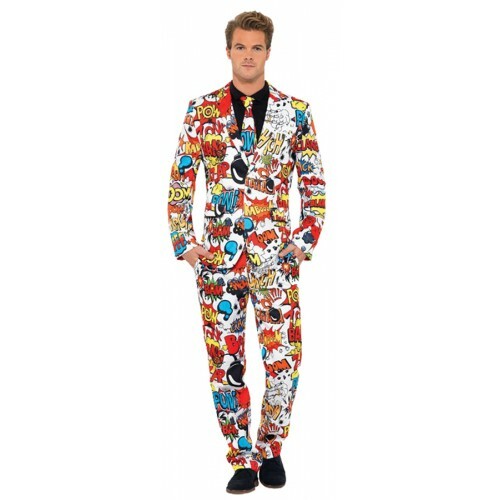 Comic Strip suit & tie. A perfect costume for those trying to make a statement. 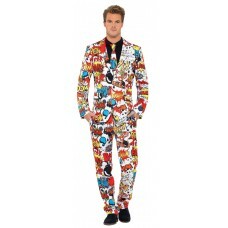 Only fashion-forward comic book geeks need apply. Coat, pants and tie. 100% polyester. Adult fancy dress costume. Dyes may not be colorfast. Dry clean only. Sizes: Medium (chest 38"-40"), Large (chest 42"-44"), & Extra Large (chest 46"-48").